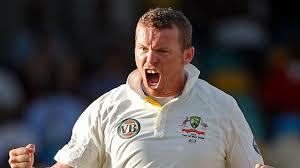 The news that the Australian medium-fast bowler Peter Siddle is a vegan was music to the ears of this particular blog. Evander is the editor of the famous feminist bible of veganism, The Sexual Politics of Meat by Carol J. Adams, a work that at 25 years old is as relevant, trenchant, and challenging as ever. Martin is himself a vegan, and the co-founder of Lantern Books, which publishes many titles on this subject. Siddle was only picked for the Australian team for the last game in the Ashes series, which the Australians had already lost, and so his six-wicket haul and relentless accuracy in the Australians’ Pyrrhic victory was in vain. There was also the usual nonsense about him lacking protein, and the worry that he wouldn’t have the stamina to bowl many overs in the heat of the Indian subcontinent (a concern that doesn’t seem to have affected Indian vegetarians). Siddle does a lot of charity work for Animals Australia’s campaign against factory farming, and for Edgar’s Mission, a sanctuary for farm animals, and for the Penguin Foundation, to “preserve and protect the little penguins on Phillip Island”. All this is good news. Might we see more vegans outing themselves in the world of cricket? This entry was posted in Australia, Cricket and tagged Animals Australia, Carol Adams, Edgar's Mission, Lantern Books, Penguin Foundation, Peter Siddle, The Ashes, veganism. Bookmark the permalink.